The coffee cupping, or coffee tasting, is a step of the coffee classification that determines the quality of the product, which is graded from “strictly soft” (the highest) to “River Zone” (the lowest). The tasting spoon is part of a set of objects needed to the evaluation made by the coffee tasters. After smelling the coffee, the classifier taste it using the spoon, then split it out on a spittoon. Normally, those spoons are bathed on silver so as to avoid altering the taste of the coffee to be classified. 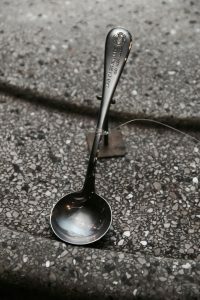 The spoon was donated to Museu do Café by Eduardo Carvalhaes Jr. on 2004. It was used on the classification laboratory of Carvalhaes office, traditional coffee dealers established on Santos.